Radom, Poland - Sixty-five years after Jewish cemeteries were demolished by the Nazis, they are now being restored and renovated by the unlikeliest of volunteers - Polish inmates. 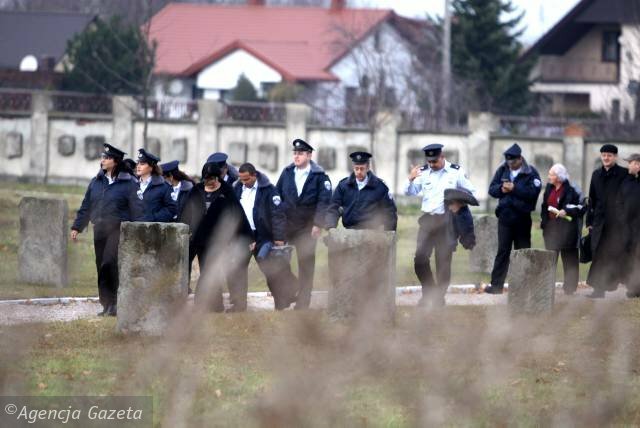 Hundreds of prisoners from some 50 Polish jails have been spending the last few months renovating and performing restoration work on Jewish cemeteries as part of a special and unprecedented collaboration between Israel’s Prison Service and the Polish prison service. More prisons are scheduled to join the project in the future. It should be noted that the prisoners participating in the project have volunteered to do so after learning of its significance from their wardens. The project was first conceived in 2005 when Israeli and Polish prison service representatives met during an international conference and decided to cooperate in various fields. 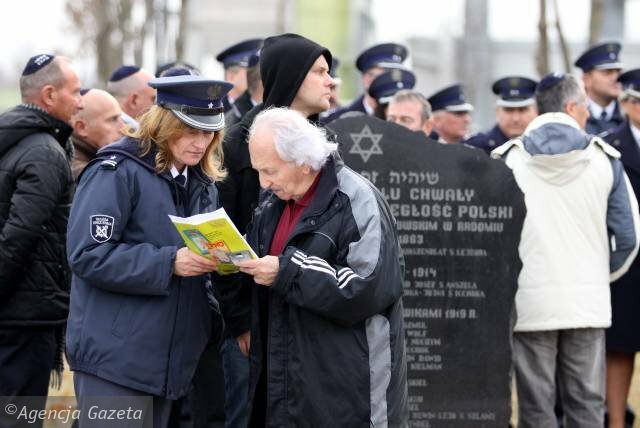 The Polish representatives later told their Israeli counterparts that the warden of a prison in Lublin had initiated the renovation of a local Jewish cemetery and that dozens of prisoners volunteered to take part in the effort. The Israelis were also told that the plan had been coordinated with Poland’s chief rabbi and the Director of Poland’s Foundation for the Preservation of Jewish Heritage, Monika Krawczyk. The Israeli Prison Service officers immediately saw the project’s huge potential and shortly thereafter offered their Polish counterparts to turn the initiative into a national project. Haim Shmulevich, former Prison Service legal advisor and a Polish native speaker was appointed as the Israeli contact person. Last January, he and Prison Service discipline director Benny Poloczek held a tour of Poland to monitor the project’s progression and finalize the necessary details of its expansion. As the project’s scope grew bigger it became apparent there was need for outside funding. This is where Brian Anderson, a British tycoon who moved to Israel six years ago, came into the picture. Anderson, 54, is the son of a Holocaust survivor who immigrated to England after WWII. He made his fortune working as an importer of Far East products since his teen years. The son of ardent Zionists, Anderson visited Israel frequently as a young man. In one of his visits, he met his wife Irit, with whom he has three daughters. After retiring and making aliyah, Anderson created a donors club for the benefit of various causes in Israel which mainly consists of wealthy British Jews. The club’s members provide funding for terror victims, lone soldiers and IDF wounded veterans. Last year, one of Anderson’s friends introduced him to the Prison Service. When he learned about the cemeteries campaign he decided to recruit his fellow philanthropists and raise the necessary funds to keep the project going. 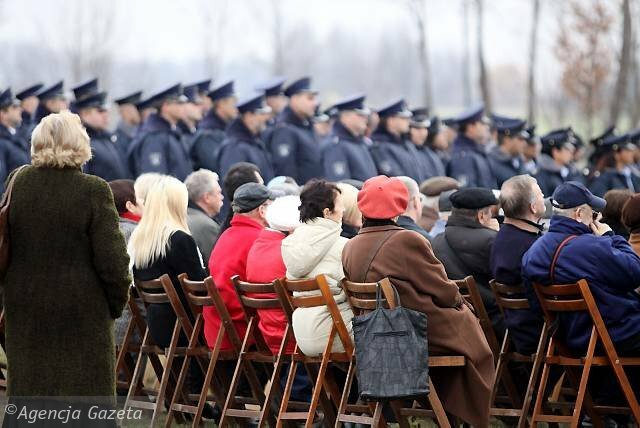 On Monday, several of a donors, together with a Prison Service delegation attended a special ceremony marking the completion of the first stage of the unique collaboration in the Polish city of Radom. 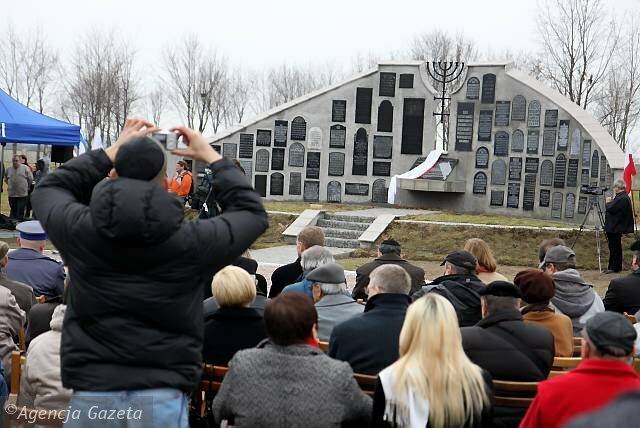 A monument built by the Polish prisoners using old Jewish tombstones was unveiled. An interesting story lies behind these tombstones. During the German occupation, a Polish tombstone maker decided to move 70 gravestones from the local Jewish cemetery to a warehouse near his house. Choosing the most extravagant headstones, he planned on selling them when the time came. In doing so, he in fact saved them. The Germans used the thousands of tombstones that remained in the cemetery to build a runway for their fighter jets and to pave a road from the city to the airport. After the war, the Communist regime prohibited citizens from holding on to items of historical value, thus preventing the Polish tombstone maker from selling his treasure. 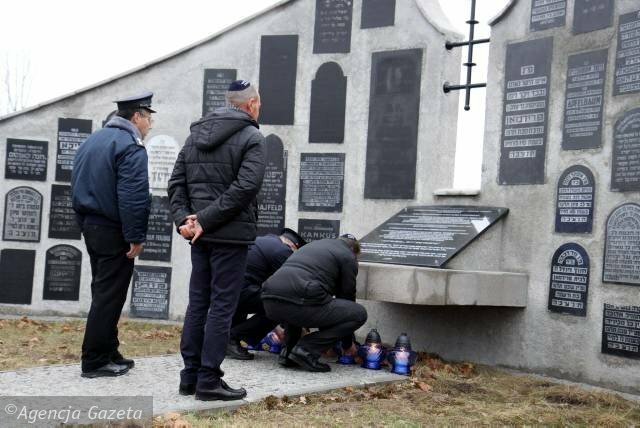 The tombstones were discovered only decades later when Haim Kintzler, chairman of the Radom Jews association visited his hometown and learned of the cemetery’s sad fate. When he discovered the hidden tombstones, he recruited the help of the mayor of Radom and together they convinced the tombstone maker’s sons to return them to the municipality, which promised to feature them in a special new museum. It took Kintzler 13 years to realize his plan and showcase the tombstones. 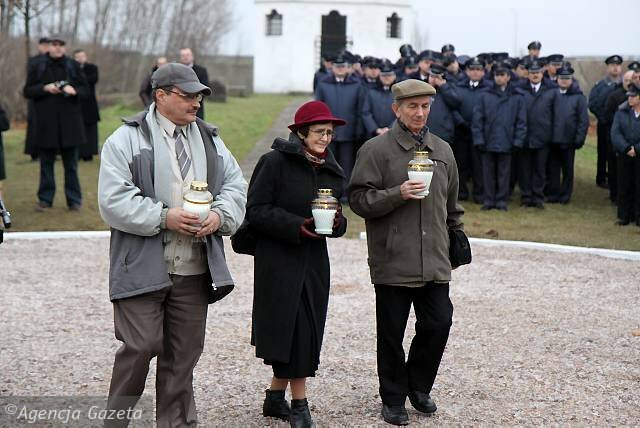 While the municipality could not afford to keep its promise, a solution was found with the help of the organizers of the Polish cemeteries renovation project. It was decided that a monument featuring the tombstones would be set up to mark the special project. 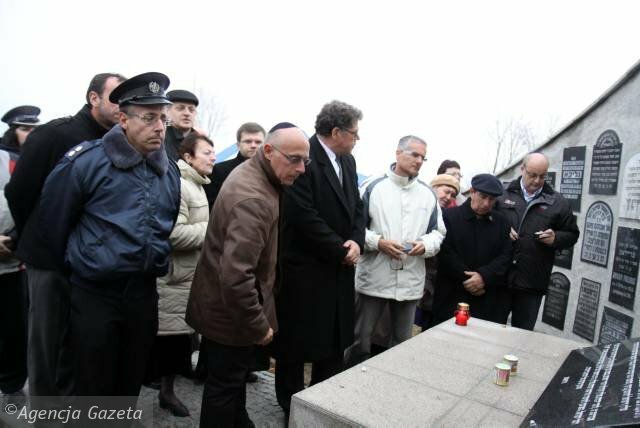 Monday’s ceremony in Radom was attended by the Polish justice minister, municipal officials, Israeli Prison Service representatives, Brian Anderson and 20 members of his donors club, as well as Israeli Ambassador to Poland Zvi Rav Ner. A hopeful sign that today's generation of Poles (and Germans) are in general different, and better, than their parents and grandparents' generation. My mother, Jessie Brooks, helped type a book called "The Book of Radom". It was edited by Alfred Lipson, our neighbor and a survivor of Radom. If someone would like to look over this book, contact me. My grandfather and g-grandfather were matzeva krichtzers in Radom. I was in this cemetery some years ago hoping to see any matzeva that they might have made.. It was absolutely barren of matzevot. I really hope that your comments turn out to be true....although I still have little trust in the Poles. Maybe when the past generations die off the anti-semitisim in their blood will thin out. “ My mother, Jessie Brooks, helped type a book called "The Book of Radom". I would be interested in seeing this book as my grandparents came from Radom. The family name is Noremberg. I am a survivor from Radom, born April 1939. I am the daughter of a Holocaust Survivor from Radom who sadly passed away last year. However, his 91 year old aunt is still alive. Please contact me to discuss this if you like. I am not sure if you will get this email, but I am researching relatives from Radom and would be very interested in looking over the book. How do I go about contacting you? “ I would be interested in seeing this book as my grandparents came from Radom. The family name is Noremberg. I am wondering if we may be related, as my great-grandmother was a Norymberski from Radom. I would love to be in touch with you. Hi , I like to know more about this book...my family come from little village close to Radom , name Jedlnia , my father was adopted by Polish family , my original Jewish family name is Cukier, they was moved to Radom Ghetto and later transported to Birkenau...any chance someone remember family Cukier from Jedlnia ?